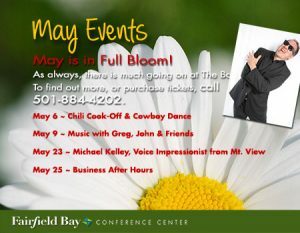 Tuesday, May 23rd, Michael Kelley, Voice Impressionist from Mt. View will be performing. 7:00 – 9:00 p.m. Tickets are $15 adults, Kids 6-12, $10 and Kids under 6 are free. Thursday, May 25th, Fairfield Bay Chamber of Commerce will be hosting their “Business After Hours”. Encore Lounge, 5:00 – 7:00 P.M.